Digesters are of interest with regards to climate change, energy, air quality, and water quality. However, digesters are capital-intensive and difficult to maintain. Profitability of a farm-based digester usually requires utilizing the energy, carbon credits, tipping fees, and marketing other co-products such as manure solids that are separated out and composted. Anaerobic digestion is the process in which microbes in the absence of oxygen convert volatile acids in livestock manure into biogas consisting of methane, carbon dioxide, and small amounts of water and other compounds. The methane produced by this process can be burned to generate electricity and/or heat. Under favorable circumstances, there is also a potential for purifying the methane into a marketable, natural gas-grade biogas suitable for household and industrial use. For more information, see Processing_Biomass_Into_Biogas. Rather than using the biogas to generate electricity, a few digester systems are beginning to upgrade the biogas to natural gas standards and trucking or piping it to off-site industrial users. One U.S. digester operator is following Sweden’s lead by powering milk trucks with compressed biogas. Digestion itself has little effect on the nutrient content of manure, but integrated nutrient removal systems have been proposed that would use digester energy to power other equipment that would divert nutrients away from land application to other uses. In addition to generating renewable energy, anaerobic digestion leads to reduced odor pollution, fewer pathogens, and reduced biochemical oxygen demand. Digestion stabilizes the volatile organic compounds that remain in the manure so that they can be land-applied with fewer objectionable odors; so many farm digesters have been installed to address neighbors’ complaints. There is little change in the nutrient value of the manure and organic matter that passes through the process, which can then be used as fertilizer. For more information, see Environmental Benefits of Anaerobic Digestion. There were 151 digesters operating at commercial livestock farms in the United States as of May 2010, according to the U.S. AgSTAR website. While the focus here is on manure, any organic matter (“digestate”) can be processed in a digester. Wastewater sludge, municipal solid waste, food industry wastes, grain industry and crop residues, and paper and pulp industry wastes are other materials that are processed in digesters. Addition of organic matter from off-farm sources to a farm digester is referred to as “co-digestion”. The additional material can increase biogas output and can also generate “tipping fees” paid by the off-farm source. The three main designs for farm-based digesters are the covered anaerobic lagoon, plug-flow, and complete mix (or continually stirred tank reactor). The solids content of the material to be digested is an important criterion in the choice of digester design. Plug-flow digesters work best at a solids content of 11–13 percent, so they work well with dairy manure from operations that collect it by scraping or other methods that do not add much additional water. Complete-mix digesters work at a wider range of 2–10 percent solids, which makes them suitable for a greater variety of materials including swine manure and processing wastes as well as dairy manure. Variations on these three basic designs have been developed to enhance biogas output and/or to deal with varying moisture levels and other digestate characteristics. For more information, see Types of Anaerobic Digesters. The rate of digestion depends on temperature, so anaerobic digesters are also classified by working temperature. Mesophilic digesters work at temperatures between 95 and 105 degrees Fahrenheit. Those that work between 120 and 140 degrees are known as thermophilic. Covered lagoons operate at psycrophilic temperatures lower than 95 degrees. They are lower in cost and are commonly used where odor control is the main objective. However, in some warmer locations covered lagoon digesters are successfully used to produce energy. It is not practical to run the manure from all livestock through digesters. The potential for methane production from livestock waste depends on size of the farm operation, freshness of the waste, and concentration of digestible materials in the manure. Free-stall dairy operations with daily-scraped alleys work well with digesters because the manure does not get mixed with dirt or stones and is moved into the digester while fresh. Municipal sewage treatment plants tend to use digesters to reduce the volume of solids and minimize the land required for spreading sludge. For more dilute wastes such as those in municipal sewage treatment plants or flush manure systems, “fixed-film” or “filter” digesters are designed to retain the bacteria on some type of medium long enough to break down the waste rather than allowing it to be immediately flushed out of the system. Europe faced energy reductions during and after World War II and is still more dependent on imports of oil and natural gas than the United States. Thus, it is not surprising that Europe has moved more aggressively to develop digesters, along with other renewable energy sources, than has the United States. Europeans call them “biogas plants”. Germany is considered the world leader in farm-based digesters with around 4,000 currently installed. Small digesters have long been used in rural areas of India, China, and other Asian countries as a source of cooking gas. Digesters reduce greenhouse gas emissions, as measured by warming potential. However, some people are confused by the fact that a digester doesn’t reduce CO2. The methane from a digester is destroyed through combustion in an engine, flare, or other device. Combustion actually produces CO2 and water (H2O). Methane (CH4) is considered to be around 23 times as powerful as CO2 in its effect on global warming, however, so the overall impact of converting CH4 to CO2 is considered beneficial. Burning biogas reduces greenhouse gas emissions in two ways: first, when manure is stored in a conventional liquid handling system without a digester, it typically emits a certain amount of methane-containing biogas. When that methane is collected in a digester and burned, it then will not escape into the atmosphere and cause warming. Second, electricity generated from that digester biogas will typically replace fossil fuel-generated electricity. There will be a reduction in CO2 emissions from not burning that fossil fuel. There are at least two ways that a farm digester operator can generate revenue by burning biogas that contains methane. One way is to sell carbon credits. Such sales are generally handled through a third-party intermediary aggregator firm that audits the digester initially to verify the methane quantity and aggregates those quantities into an account that is sold to a buyer who has committed to some level of greenhouse gas reduction. The aggregator then monitors performance over some agreed-upon contract period. Another way of generating revenue is by marketing renewable energy credits (RECs) to an electrical utility that is under mandate to generate part of their electricity from renewable sources. In Minnesota, for example, utilities must obtain at least 25% from renewable sources by 2025. The REC value would typically be negotiated as part of the power purchase agreement between the utility and the digester operator. More stringent water quality regulations are also pressuring livestock operations to minimize nonpoint nutrient losses and in the future may also offer nutrient credit trading opportunities to generate additional revenue. Digestion converts volatile organic compounds in manure to more stable forms that can be land-applied with fewer objectionable odors; so many farm digesters have been installed to address neighbors’ complaints. 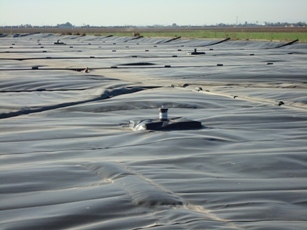 Nutrients do not disappear in a digester, although some may settle out. Organic nitrogen is converted to ammonium during digestion, so the ammonium level in the digestate typically rises. This conversion may make the nitrogen more rapidly available to the crop once land applied, which may offer opportunities to change application rates and timing. Without a change in nutrient amounts, adding a digester is unlikely to have a large impact on water quality. Digesters are often included along with manure storage facilities, solids separators, and composting facilities in an improved overall system. Taken together, the system may offer great opportunities to improve water quality by transporting the manure nutrients to fields where they are most needed and applying them when the crops need them most. Use of separated dairy manure fiber for bedding is common, despite concerns that it might increase mastitis problems. The concern is greatest in warm and moist conditions. Determining the impact on mastitis is complicated by a number of factors, including different ways of measuring the concentration of bacteria in bedding (by weight on a wet or dry basis or by volume); changes in bacterial levels in bedding during the time it sits in the stall; the relationship between bacteria in the bedding and on teat ends; and the impact of bacteria in bedding and on teat ends on the occurrence of mastitis and on milk quality. More research is needed to clarify the impact of bedding type on mastitis, in the context of the many other management factors on a typical dairy farm. The economic value of solids as an off-farm soil amendment appears to vary widely, depending on the seller’s marketing expertise and location. The capital requirements to install a digester will vary widely depending on digester design chosen, size, and choice of equipment for utilization of the biogas and/or for separating out manure fiber. The current capital cost range for complete digester systems is estimated at $1,000 to $2,000 per cow depending on herd size, with the cost to maintain an engine-generator set at $0.015 to $0.02/kWh of electricity generated. An AgSTAR regression of investments made versus herd size at nineteen recent dairy farm plug-flow digesters gave a result of $566,006 + $617 per cow in 2009 dollars. Ancillary items that may be incurred are charges for connecting to the utility grid and equipment to remove hydrogen sulfide, which could add up to 20 percent to the base amount. Figuring the ancillary items at 10 percent, the investment works out to $1.2 million for a 700-cow dairy operation, going up to $2.7 million for 2,800 cows. A similar regression for thirteen mixed digesters gave $320,864 + $563 per cow. A solids separator would add up to another 12 percent to these amounts. There is considerable interest in digester designs that are economically feasible for smaller farms, but some digester components are difficult to scale down. 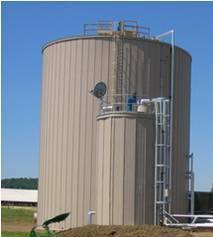 A complete mix digester with separator installed on a 160-cow Minnesota dairy farm in 2008 cost $460,000, or $2,875/cow. Another recent study found that the electrical generation equipment made up on average 36 percent of total investment for a group of 36 digesters, suggesting that substantial cost savings may be possible in situations where the biogas can be used for heating rather than to produce electricity. The federal government and many states offer incentives for installing digesters. The 2008 Farm Bill included two grant and loan programs that cover digesters – the Rural Energy for America Program (REAP) and the Value-Added Producer Grant Program. REAP provides grants of up to 25 percent of project cost and loan guarantees of up to $25 million. Value-Added Producer Grants can provide planning costs and working capital. Utilities will also sometimes underwrite part of the cost of the electrical generating equipment. While most farm-based digesters in the U.S. generate electricity with the biogas, negotiating an acceptable agreement with the local utility is often a challenge. Arranging financing and obtaining permits are other challenges that producers have noted. A potential concern with accepting off-farm wastes is that on livestock farms with small land bases, the livestock manure alone may already have too much nitrogen and phosphorus for the cropland available. Imported nonfarm organic wastes would contain additional nutrients which could exacerbate the cropland nutrient imbalance. The tipping fees and added gas output need to be weighed against potentially greater manure hauling costs to take the effluent to more distant cropland where the nutrients can be utilized. A digester is a major capital investment, and calls for a careful engineering and economic analysis of the particular situation. Consultants and computer decision tools are available to assist with the analysis. Published digester economic assessments tend to show that the most successful digesters are those that have generated added value from separated manure fiber, charged tipping fees from accepting off-farm food processing wastes, or had a nearby high-value use for the biogas or electricity. Pathogen reduction is another frequently-cited benefit of digestion. Electricity sales alone are not usually enough to cover costs. Even an unprofitable digester may be regarded as successful if it provides nonmonetary benefits such as odor control. Curt A. Gooch, P.E. and Jennifer L. Pronto. Capitalizing on Energy Opportunities on New York Dairy Farms: Briefing Paper, Dairy Power New York Summit: Creating a Greener, Cleaner Future, October 29-30, 2009. Lazarus, William F. Farm-Based Anaerobic Digesters as an Energy and Odor Control Technology: Background and Policy Issues, Agricultural Economic Report 843. 2/2008. Washington, DC, USDA Office of Energy Policy and New Uses. Mullins, Patricia A. and Tikalsky, Susan M. On-Farm Anaerobic-Digesters: A Study of Energy Grant Recipients – Phase II Report. 10/2006. Resource Strategies, Inc.
Resource Strategies, Inc. Phase I Report: A Survey of Farm Bill Section 9006 Renewable Energy Grant Recipients, 2003 and 2004. 2006. Topper, Patrick A., Graves, Robert E., and Richard, Thomas. The Fate of Nutrients and Pathogens During Anaerobic Digestion of Dairy Manure. 7/2006. U.S. AgSTAR, U.S. Anaerobic Digestion Capital Costs for Dairy Farms (web page), May 2010, accessed 9/27/2010. 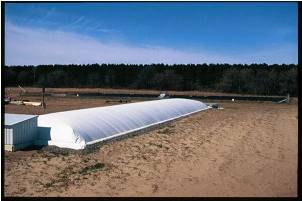 U.S. AgSTAR, Anaerobic Digesters Continue to Grow in the U.S. Market (web page), May 2010, accessed 9/27/2010. U.S. AgSTAR, Market Opportunities for Biogas Recovery Systems: A Guide to Identifying Candidates for On-Farm and Centralized Systems (web page), 2004, accessed 6/11/2007.